It's that time of life when people start getting engaged. Similarly, it's that time of season when people reconvene, reunite, and show off their engagement rings. I don't know if it's just some kind of a switch that turns on when a girl becomes a 20-something, but I've taken notice to engagement rings sitting on fingers lately. Although it's hard to tell, because that just might be my short attention span saying, "Ooh shiny". For now though, I'm currently content with my gold ring that costs under 5 bucks. And it's prettier than some of the thousand dollar rings that I've seen. Your ring is indeed gorgeous dear and for that price.x I totally agree with you, there are some pretty expensive ones out there and they are not nice at all! I absolutely love this outfit of yours, gorgeous colour combination.x Your skirt is amazing, love the print! Pretty as always! Thank you so much for stopping by my blog, for your lovely comment and for following me. Just followed you back via GFC and also followed you via Bloglovin.x Have a lovely day! Ok, your skirt is to die for! Love it! The $5 ring? Even more beautiful at that price. It's great! I agree. You gold crystal ring is really pretty. That is a pretty ring, I will say. I'm past the point of all of my friends getting engaged, now they are all having babies! So crazy. I love your black boots and bag and how they toughen up your girly look! I have the same "ooh shiny" reaction, haha. I love the softness and femininity of this outfit! Hahaha...I'm one of those offenders, ooh shiny is something I always say while shopping haha :) Amazing outfit, love tbe cozy cardigan and that skirt! Oh I agree, that ring is super pretty! And you sure can't tell it's so cheap. I love the whole outfit you're wearing. That purse is just so adorable! And your shirt is just the cutest color. I just love that floral skirt! Great look! you look lovely. I like your Cardigan and skirt. Thanks for your comment. let me know if you want to follow each other to stay in touch. Have a great day! 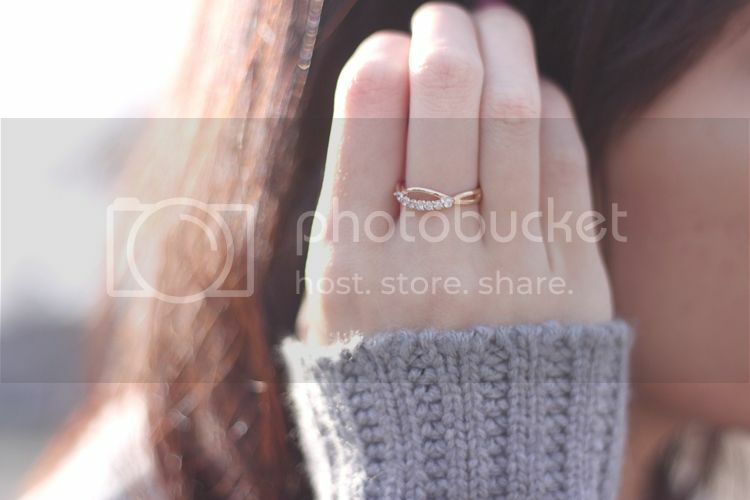 That ring is the cutest! 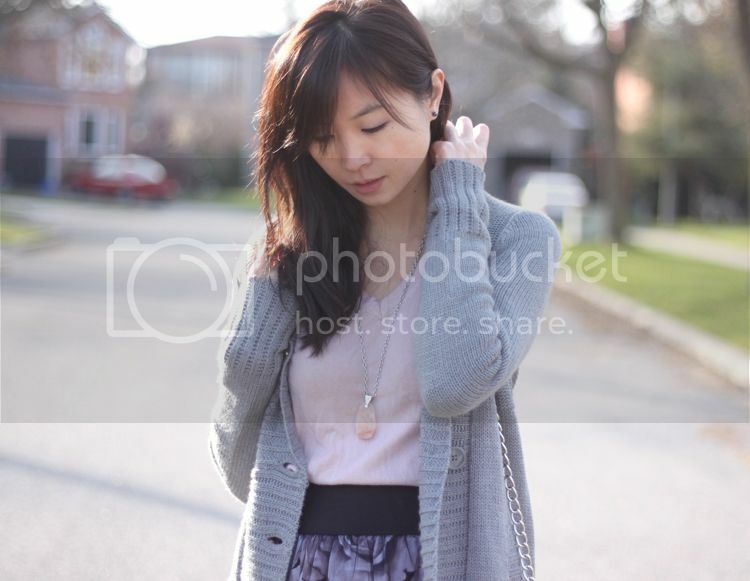 Such a pretty outfit, I love thr colour scheme of grey and light pink. The print on the skirt is so lovely and the ring is too! Yes, I can relate! But it's okay, because we *do* have our fabulous costume jewelry to wear, and that is far more fun, I'm sure you will agree. What a great look! That skirt is gorgeous! great ring! and you're outfit is nice! greetings from Holland, take a look at ours? It's a very feminine and delicate ring! I LOVE this! That long sweater looks amazing with your skirt. And so it does your outfit, I love your skirt and the way you conjugate the colors in here is just amazing!